Animation, sound and images get to be one and only in this new chapter of the project New visions for a young audience created by Teatro delle Briciole. 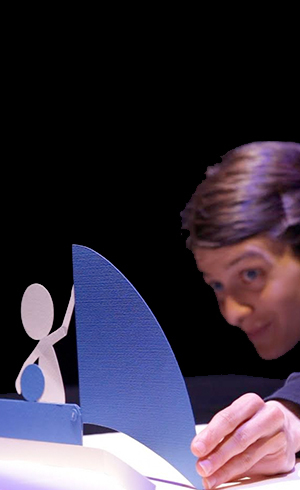 In re-inventing the pop-up book for the stage, Pop Up presents the little adventures of a paper-child with an enigmatic sphere: a relationship through rhythm, color and sound, its actual encounter, its mirror-image, its transformations. Colorful pop-up illustrations succeed one another during the show and are quite powerful to stimulate basic-emotions and create associations between feelings, forms, and colors. The many variations of the theme are a musical support for the sound effects and are also a splendid way to explore the imaginary world of young children. The adventures of the child and the small sphere generate some kind of a symbolic game through geometry and metamorphosis that triggers some aspects of this imaginary world: fantasy, invitation, fear, and dream. Two actresses bring the two paper-characters to life and give them each a voice while they are playing with the figures and shapes and while they are intertwining them to their own body, while they are playing with the movement and the illusion of movement, and with the synchronicity on one hand of the different voices and on the other of the voices with the images.